For one revolving door model series there exist numerous gearbox solutions – thus it was our goal to develop a single gearbox solution that can operate the various revolving doors. The bevel gearbox should have a ﬂat, low-noise design. Weight also played an important role. The demands did not allow for use of standardised bevel planetary gearboxes. Instead, we designed a planetary gearbox with a bevel stage. A great challenge: The operating noise should be minimised, the space requirements reduced and the torque increased. 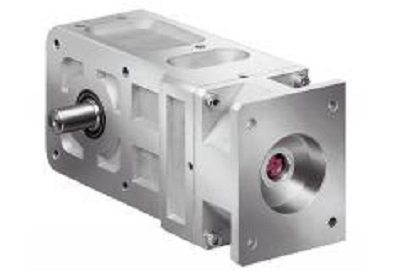 A crown gear with a preceding 2-stage planetary gearbox was integrated on the output side of the aluminium housing. To reduce the operating noise, all gear teeth, the housing and the motor extension were optimised for reduced noise.